Despite geographical and topographical differences between the two countries there is relative uniformity in the way the youth allocate their priorities. In poetry, youth has long been described as the spring of life; a time, when the best is yet to be, and nothing is impossible. Today young people in India and Russia are more realistic about their position in society and understand their strengths and limitations. What is the common denominator of the young people of both countries, so distant and seemingly different, both culturally and climatically?!! 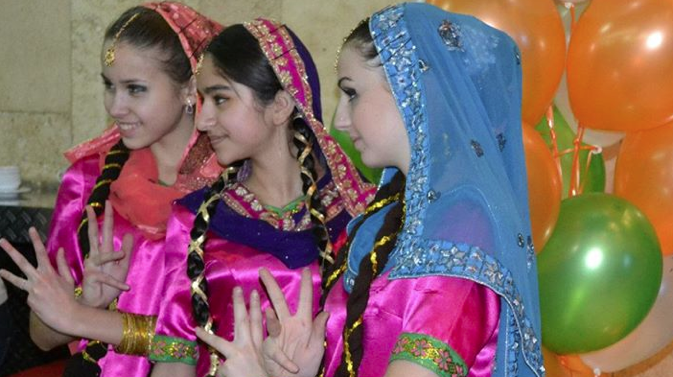 Indian and Russian youth, with roots seeped in traditions, are seeking to also assimilate the western way of life. Despite geographical and topographical differences between our two countries there is relative uniformity in their allocation of priorities. Both countries have a rich past and deep rooted traditions. All this and a mutually emotional bond, resulting from the cultural and political friendship historically shared between Russia and India, which today's youth witnessed in their formative years serves to unify us. Russian and Indian youth often find themselves participating in socio- economic processes much earlier than their Western counterparts. Today, both Indian and Russian young people are struggling to discover themselves. They seem to be wandering in search of identity, and to establish a footing in the world of today. Despite the influx of western entities such as McDonald's sprouting everywhere and gaining popularity, both in India and in Russia, every “Ivan and Maria” still loves borsch, the traditional Russian soup, and every “Rakesh and Seema” still likes dal-roti, the Indian staple diet! Grandmother’s kitchen is still dear and close to the heart! In India, you can often find young people who wear traditional dresses in a fusion of styles, such as an Indian blouse or shirt with western jeans. In Russia too traces of traditional fashion are abundant, for example, one can see traditional Russian braids on young women in jeans and “Valenkis” traditional boots, especially in villages. In this era of globalization preserving their own culture and identity in a rapidly changing world is a pressing need for both Russian and Indian youth. Another key challenge that confronts the young people of our two countries - is ideological tolerance. In Russia, as in India , there has been a recent spate of different social groups with different ideology based on religion , political beliefs , racism and sexual preferences . In recent years young people have demonstrated that they are aware of their rights and stage protests to express themselves and be heard. The presence in society of Russian skinheads and Indian youth groups with similar fanatic racist views illustrates the struggle of preserving one’s identity and a perhaps misplaced sense of belonging. This identity crisis is among the biggest challenges today not just for the youth but for the society of both countries as a whole. Our youth clearly need a "mentor." It is imperative that there be “older youth” who could understand and help constructively channel the energy of their juniors, so that they are able to rationally steer clear of extremist appeals. The great Alexander Pushkin in his novel "The Captain's Daughter," speaks of "senseless and merciless revolt," to which, alas, youth is so inclined to be led. Misguided youth can easily succumb to political manipulation. Today's world is a rapidly changing one. The youth are quick to adapt to new conditions of life, and is therefore a huge strategic resource in countries with such rich cultural traditions, such as India and Russia . Youth is a time of "flexible" soul and mind. A country’s youth form an important part of society and perform special social functions. They inherit the achieved level of development of society, and links the past with the future. The young members of society are responsible for maintaining the continuity and development of society. The youth in our countries are divided into two parts – one, that is still studying and the other which has stepped on to the economic roller-coaster of life, each with its own set of challenges. One of the most common problems faced by young students, in Russia and India is the problem of education: a place in a hostel, prohibitive costs of higher education , a small stipend, and the looming threat of unemployment. In modern Russia, one of the pressing problems for young people is housing. In India too, especially in the bigger cities or metros , an increasing number of young people are flying the proverbial nest to live separately from their parents , and therefore need a place to live. The prohibitive cost of real estate makes acquisition of property a lifelong dream and struggle. Economic instability and crisis affects young people most as they are still struggling to find a footing. In this era of globalization, young people must adopt new global ethics and cultural trends. Intercultural communication and cooperation can make this possible and can help achieve this goal. Given that our goals and challenges are similar with a resembling set of values, the youth of India and Russia may seek to resolve pressing problems by pooling their intellectual resources. There are some other challenges too that have sprung up in the way of our youth. It is said that a healthy mind, a healthy body - In this era of internet and social networking youth in the big cities of our country has become less interested in sports and exercise. Further, the inability to find work in their respective fields within the country is resulting in a steady brain drain with an exodus of the intellectual elite to Western countries. These problems need to be addressed by our governments. Russian and Indian youth seem to be taking off their rose-tinted glasses and taking matters of social importance into their own hands, working as agents of change. Various youth organizations in our countries bring to mind the Soviet Komsomol and are trying to deal with social evils like drugs, corruption and paedophilia. These are our "soldiers of social change". As Rajiv Gandhi, the youngest ever Indian prime minister and a youth icon, said "Let us build a new civilization, with the strength of our heritage, the creativity of the spring time of youth and the unconquerable spirit of our people..". Today, with unpredictable economic conditions and influence of globalization, the life of Russian and Indian youth is extremely complex. It is for us, the people of these two great countries, to understand that while we cannot guarantee the youth a "golden" future, preparing a "golden" youth for our future is in our hands. This essay won the first prize in RIR’s competition held in October and was translated from Russian by the author.